When planning trips or holidays in the company of elderly or disabled persons it is advisable to plan ahead and check that the holidays are accessible and suitable for their needs. A holiday should be enjoyable for all concerned and not a worry for some members of the party that they are being a burden. Even with an organised trip check with the tour company that the hotel has facilities for anyone in your party with a disability. Simple things like lack of lifts to the rooms or step up into the hotel can be overlooked when planning holidays. If in doubt do not leave it to the travel company to check your needs are catered for, contact the airline and hotel yourself. 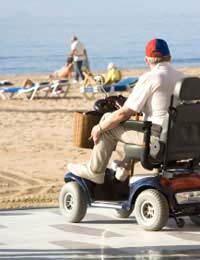 You may be travelling with an elderly parent who cannot manage the long walk across the airport or to the beach. By hiring a wheelchair the holiday will be stress free and enjoyable for all. Bathrooms and showers may also be another problem for the disabled and by booking a room with facilities such as wider doorways, grab rails and wheel in showers life can be made a lot easier. Specialist holiday companies are now able to provide every facility for the disables or those with special needs. Hoists, scooter hire and special beds are part of the holiday package along with guided tours and extra helpers to make the holiday as enjoyable as possible. With the advent of online advertising it is possible to research about resorts and facilities before planning most holidays. Access to the swimming pool should also be catered for and don’t forget to ask about special diets for your party when booking. Clubs for the elderly and disabled will often arrange trips and guided tours for their members and their families. By going on these tours and trips you will be assured that facilities have been checked for members and there should not be any problem with access to toilets and restaurants. When booking a holiday read the testimonials from previous holiday makers as this will give you a good idea if the advertised facilities are as good as the company says they are. Chat to fellow members of any clubs you belong to and follow up on recommendations. Organisations for the disables and the elderly will also have a list of suitably accessible holidays. Make sure that all holiday insurance is up to date for your own peace of mind. Carry details of all medication in case any is lost during the holiday or baggage is lost during travel to your destination. Let everyone [possible know that you have an elderly or disabled person in your party so that they can arrange facilities to suit the traveller without embarrassment on either side. For those with special needs there is no longer any reason not to take holidays as there are now accessible holidays and guided tours to suit everyone.